Mint Chocolate fudge for St. Patrick’s Day. Any excuse for chocolate! Mint is the bonus. The green gives it street cred for St. Paddy’s Day – though it also fits spring, Easter and the whole of the Christmas season, New Year’s, Mardi Gras—yeh! And this is the very best fudge recipe ever! Triple winner! Use a sharp knife to cut 1 inch squares of fudge. Print these Irish Blessings if you are celebrating St. Patrick’s Day with this awesome fudge. Gift it. Keep it. Share it. Hide it. Whatever helps you enjoy the richness to the fullest! 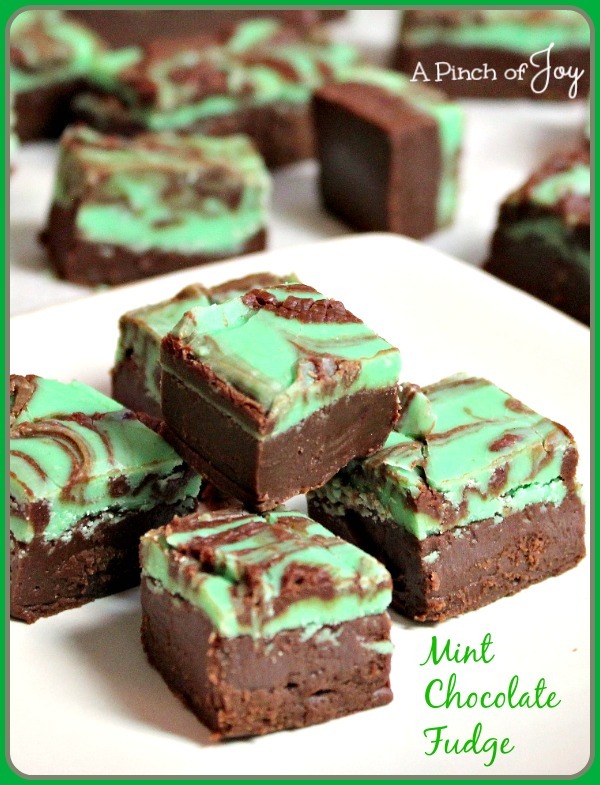 Smooth, creamy, mint swirled chocolate fudge. Pretty to look at treat for any holiday or season celebrated with green -- any day of the year! Line a second 8x8 pan with waxed paper parchment paper or aluminum foil, leaving two or three inches on each end. Spray lightly with cooking spray. Place butter, chocolate chips, vanilla and 1 cup of sweetened condensed milk in microwave safe bowl with lid and set aside. Put the lid next to the pan with hot water. Place vanilla candy coating, peppermint extract, food coloring and remainder of sweetened condensed milk in second microwave safe bowl and set aside. Place bowl with chocolate chip mixture in microwave and cook on high for 30 seconds. Stir softened mixture well. Cook for another 30 second burst. Stir again. Mixture should be soft enough to incorporate all the butter and appear somewhat shiny. If necessary, microwave again for twenty seconds. Quickly spread into paper lined pan, using rubber spatula. Reserve about ⅓ cup of the chocolate mixture. Set bowl with chocolate mixture into the hot water and cover with lid to keep soft. Microwave candy coating mixture at 30 seconds on high. Stir and repeat. Mixture should be soft enough to mix thoroughly. If not, microwave for 10 second burst. Mixture should be smooth with color and flavoring well distributed. Quickly spread green mixture on chocolate layer, working quickly and gently so as to not disturb the chocolate layer underneath. While green layer is still soft, pick up the reserve chocolate which should be somewhat soft and drop by teaspoonsful atop the green candy. Do not add hardened chocolate to mix. Gently draw the cutting side of the small spatula toward you in shallow motion. You can make straight lines or swirls, but be careful not to draw the first layer of chocolate into the mix. Lift fudge from pan, using paper handles. Cut into 1 inch squares. Great photo! Oh my goodness…this looks sinfully delicious…I am going to make it for dessert for my monthly girls luncheon. Thanks for sharing the recipe. Hello! These look delicious! Perfect for St. Pat’s Day! Thanks so much for taking part in the 6th annual St. Pat’s Bog Crawl! Slainte’! Yummy! I wouldn’t be able to wait 2 hours either.